Using location data, mapping, and spatial analysis to get more value from your business system. Business systems contain a gold mine of location data that’s just waiting to be tapped. Customer addresses, store locations, sales territories, and supply chains are just some of the data you can map, analyze, and deliver to users of your business system to enhance real-time decision making, improve operational efficiency, and facilitate collaboration across the enterprise. Retail merchandisers can decide which products to buy based on local demographic and lifestyle data. Insurance risk managers can analyze local risk factors and conduct “what-if” analysis using powerful predictive spatial models. Supply chain managers can ensure that stores or factories have enough stock to meet demand based on real-time shipment tracking, natural or man-made disruptions to the supply chain, or spikes in demand based on local events. Why are best my customers clustered around this location? It looks like freeway access may have something to do with it. Where are the service calls to schedule today located? It looks like I can group them geographically to save on travel time and get more work done. What suppliers will the tsunami impact? It looks like I need get materials from a vendor outside of the affected area. Seeing data on a map, in context with its surroundings, leads to quicker and better decisions because maps play to peoples’ innate spatial reasoning capabilities in a way that’s not possible with bar charts and other traditional visualization options. From the shop floor to the boardroom, managers and executives can go beyond dots on a map to intuitive, interactive maps, story maps and infographics that bring data together from your business system and other sources to create actionable information products and a collaboration environment centered on the ubiquitous, universally understood map. 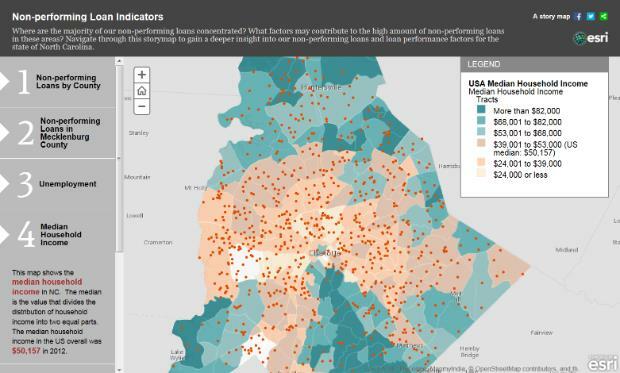 Interactive Story Map on non-performing loans. Getting data into your business system is often far easier than getting it out. With so many business applications based on so many data models and hierarchies, it can be a challenge to navigate quickly to the correct information. A simple object, such as a building, may be represented at one hierarchical level in the system, but may sit at different levels in Real Estate, Project System, Environmental Health and Safety, and other business applications. Even with application-specific training and a cheat sheet, navigating to the right record can be difficult, and if you are not familiar with the application it’s nearly impossible. Spatially enabled business applications let users retrieve data from their business system or other sources simply by clicking on objects displayed on a map. It requires no understanding of data hierarchies, search codes, or how to navigate menus. From a spatial point of view, for example, a building occupies a single geographic position that can be used to access data from any level of any hierarchy or other data structure within your business system. In effect, the map serves as a front-end gateway, pulling together related data from all of your business applications into a single, unified view. Whether you select a single object or multiple objects, manually or with a spatial selection tool, a spatially enabled business environment greatly improves the speed and accuracy of getting data out of business applications. Armed with new insights from your spatial visualization, and the right data from your business system and other sources, you know what do. But how should you do it? You could fire up a business application to launch a transaction, but why not do it right from the map? In a spatially enabled enterprise, users are not limited to viewing the underlying data; they can also use the map interface to transact with it. When a user right-clicks on an object, for example, a menu of options might appear to release an order, optimize a route, or delete a location from the map—and it can be configured to modify the underlying data from the business system as well. The map should be considered a first class citizen among other business user interfaces. It can initiate transactions to create, read, update, and delete business objects and associated data, depending on the user’s permissions. Visual verification that you have selected the right business object and are accessing the right data for making a decision can prevent costly mistakes, such as sending a crew—or parts—to the wrong location. Accessing data from both SAP EAM and SAP Real Estate and taking action. Trace a power network to find all customers affected by an outage. Extract demographic data to a custom trade area by overlaying it with census block groups. Predict the likelihood of finding oil or contaminants between sample points. Optimize the operation of a fleet of a hundred vehicles that service hundreds customers each day. Tasks such as these require advanced spatial analysis tools. Typically they work outside of the traditional business intelligence (BI) world, performing analyses users just can’t do in their heads, no matter how good the visualization or how spatially adept the user is. A spatially enabled enterprise can deliver ubiquitous access to advanced spatial analysis and embed that information within operational applications such as SAP Lumira or SAP Business Suite, as well as other enterprise applications. The user sees the results without needing to understand and use the location technology that created it. Address geocoding, drive time analysis, and demographic data enrichment in SAP Real Estate. Most organizations today have begun to use location technologies, but only for basic visualization and data access. Most have incorporated the ability to refresh associated charts, graphs, and tables based on a spatial selection, or refresh a map based on a report filter. There is a lot of room for improvement. Business analysts should have some training in map visualizations and spatial analytics. Real-time spatial data should be delivered to the enterprise at big data scale. Spatial visualization and analysis should be pushed down to the operational level, where the many small decisions that ultimately determine profit or loss are made by business system users every day. 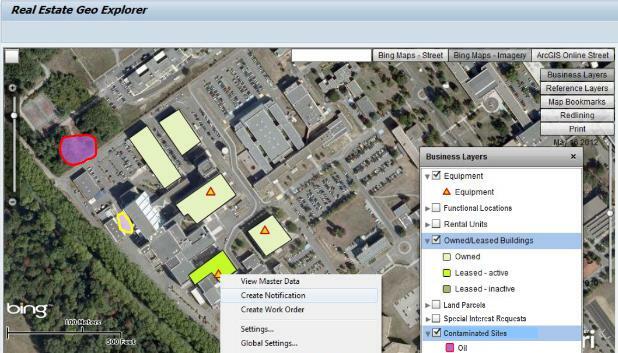 Operational access to focused, packaged spatial apps and tools. Finally, the platform should enable the enterprise to communicate and collaborate around its story maps as effectively as it does with BI storyboards and other collaboration tools. In the spatially enabled enterprise, spatial data, visualizations and analytics are corporate assets that increase productivity and profitability. Does your organization have a location strategy?